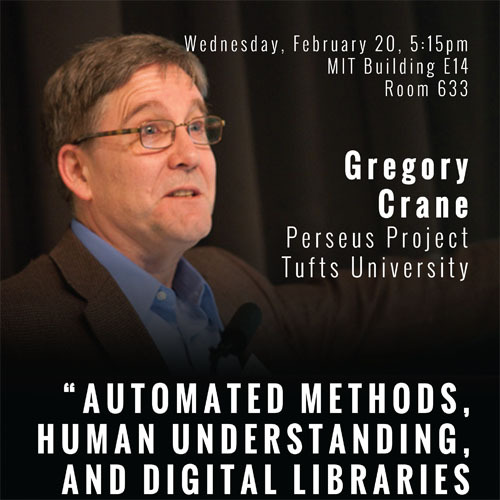 Please join us for this exciting talk by Gregory Crane on February 20, 2013 at 5:15 PM in room E14-633. Event organized by Literature, co-sponsored with CMS, MIT’s HyperStudio for Digital Humanities, and Ancient and Medieval Studies. Millions of documents produced around the world over more than four thousand years are now available in digital form – Google Books alone had scanned, by March 2012, more than 20 million books in more than 400 languages. Images of manuscripts, papyri, inscriptions and other non-print sources are also appearing in increasing numbers. But if we have addressed physical access to images of textual sources, we are a long way from providing the intellectual access necessary to understand the written sources that we see. This talk explores the challenges and opportunities as we refashion our study of the past from ethnocentric monolingual conversations into a hyperlingual dialogue among civilizations, where humans work with machines and with each other to communicate and where books do, as Marvin Minksy opined decades ago, talk to each other. Gregory Crane is Chair of the Department of Classics at Tufts University, as well as an Adjunct Professor in Tufts’ Department of Computer Science. Since 1988, he has been Editor-in-Chief of the Perseus Project, a long-running digital humanities effort focused on Greek, Latin, and Arabic Classics.